I haven't read Thomas Sowell's Intellectuals and Society but ever so often I read something and share more in his skepticism of intellectuals: skepticism of what they do and what they want others to do. It sounds like such a nice word. It comes from the Latin intellegere, meaning "to understand" and it conveys a sort of lofty attention to reason, a philosophical detachment from emotions. The World English Dictionary lists it as, "delight in mental activity" which sounds so very cerebral, like you're some genius ecstatic by the quantity and profundity of your thinking. Now in all of this praise for oneself and one's endeavor is liable to make one quite haughty about both. "I'm a smart person, I've set my great brain on this matter, I've solved it, and people ought to listen. I'm an intellectual!" Now I'm not going to start bashing reason and thinking, but I would like to raise a few questions about the intellectual project. Well, one at any rate: what is it? Namely, 1) does it attempt to understand by welcoming criticism, reflection, change, variation, modulation, interpretation, and perhaps synthesis with other ideas? 2) Does it imply that it itself is the truth and ought to be followed. Or 3) does it simply present itself and not impose any further? Perhaps #1 and #2 are silly questions: surely a thinker on the one hand hopes his ideas are true but on the other would welcome correction or incorporation into the truth. Now is position #3 possible? Can you actually write, think, or do something and not hope it to be emulated somehow? I've pondered that question a lot when thinking about the possible effects of my own writing. It seems that all writing sort of exhorts the reader to do something. In fact could one say all thinking is to some end? So it's a sort of gamble, thinking. You could easily go very wrong. It's a sort of odd problem isn't it? How is it possible to think something which is impossible? Where did that thought come from? Why should we be able to imagine something which is not? I think that's what intrigued some philosophers when considering artists: how did they come up with that? From whence did that art come? Hence Nietzsche's fascination with the creative power of the artist and Plato's explanation for how a random person like Tynnichus came up with something like his famous paeon ode (he was inspired by the Muses.) One might be tempted to say: yes you created something new but the potential was there. The words, notes, colors, et cetera already existed. (This argument, similar to Aristotle's explanation of change via the concept of the potential) has much merit. But what about an idea? Again on the one hand you might say that reality somehow prompted you to think that idea. Indeed, perhaps. Yet if it is wrong. . . then it's only an idea. For example, I can interpolate two ideas which are impossible in reality: the plane Jupiter with human feet. So this mis-perception has sort of produced something and thus it's really quite striking you could come up with something, however you do it, completely at odds with reality. So that's a very long-winded way of saying it is possible to be wrong. Indeed. I apologize for the discursion. Yet truth is a fickle thing. For example, consider Shakespeare's Hamlet. It didn't happen, maybe it couldn't have, maybe nothing like it ever will. Yet there is something truthful about what happens in it. Likewise science seems only to offer provisional truths, each being superseded by a model more consistent with observed phenomena. Yet there is something truthful even in the primitive explanation. Now I'm not advancing ditching reason, but I think an awareness of these epistemological issues should give an intellectual a little modesty. Such an awareness should make it a little harder to say, "Hey do x, y, and z" especially when they haven't been tried before. Or especially when they have been tried and have failed. You would think this kind of awareness would be present in intellectuals, if indeed they are intellectuals. Now we all have ideas about which we are fairly certain, very certain, not so certain, and so forth. Now aside from any particular moral reasons, you would think this uncertainty would affect what you exhorted others to do, let alone what you deign to force others to do. That's why, from this principle of philosophical uncertainty alone, I think federalism and republicanism are laudable practices. The ideas everyone believes in go at the top. Everyone follows those rules but there are very few of them. Some ideas apply only at the state level; there are more of them but not too many. And so forth down until you reach your personal values which are your own personal idiom. Thus the intellectual might offer a caveat: "Here is what I am thinking, what I believe, or how far I've come in considering this problem." Perhaps we might add, "I hope it helps" or "Do good with it." Yet I keep wanting to add more caveats. You don't want to be responsible for leading someone to anything bad, but once you get someone thinking that's certainly a possibility. Of course it's not really your fault, per se, but how would you like to have been responsible for getting some dictator "thinking"? Now this problem is of course not new and has plagued philosophy from its birth. Socrates was of course tried for corrupting the youth. Surely if anyone could have vindicated philosophy Socrates could have. Well, in his own defense he says that he didn't take any money for what he did. He also said that since bad people harm others, why would he corrupt anyone, who would come back and harm him? Thus he must have corrupted them unintentionally. In the Crito he notes that even if he is not guilty, he has been found guilty and must follow the laws. How could he disgrace the laws of the city that raised him? How could he accept exile and lose the rights of a citizen and live in other disorderly cities? Would not disobeying the law corrupt the youth, and then prove the judges right?–Is this is really a defense of philosophy? How would you understand the effect Socrates had on Alcibiades? Alcibiades was an ambitious, young, political man. What did Socrates teach him? Isn't it possible that if you take an ambitious young political man and you give him gifts of philosophic criticism you can turn him into a very dangerous man? Yet might also ask, "Is it moral not to question?" While reason and philosophy don't guarantee truth or goodness, you are at least aiming at both. If you are not questioning how things work, what your place is, what you ought to do, then how do you hope to do good? To question or not to question? And if to question, how? And once you have your answer, how certain are you of it? And even if you are quite certain, what are the implications of that truth? Does it give you responsibility, authority? In his apology Socrates tells the story of how he goes out seeking to disprove the oracle and find someone wiser than himself. He looks among those reputed to be wise, among politicians, among poets, and among the artisans. Those reputed to be wise had no sense of what they didn't know, the artisans thought because they knew one thing that they could speak of all things, and the poets could not even explain their own poetry. Socrates did not find any of these men wiser than himself because they had no hint of their own ignorance. It seems that this underlying requirement of philosophy, and admission of ignorance, is in some tension with a desire to do good and improve one's soul, which are positive acts. The admission, though, ought not diminish one's zeal but rather temper his conceit. Sir John Eliot Gardiner thinks there is something French about Beethoven's 5th Symphony. Did Beethoven use French tunes written during the Revolution to incorporate ideas of rebellion and liberty into his symphony? For Saturday, September 25 through Friday, November 12. 15) Is Economics a Science? 16) Does a Shipwreck mark the site of a Punic War battle? In his 1960 book The Constitution of Liberty Friedrich Hayek wrote a short essay titled Why I Am Not a Conservative in which he differentiated among modern liberalism, Classical Liberalism, American conservatism, continental conservatism, and socialism. It seemed to Hayek as it did to Mencken, that American liberalism had become decidedly illiberal and that while the conservative was now allied with the defender of liberty against socialism, they were far from one and the same. Minimally, Hayek was correct to distinguish among these movements. Besides for the sake of satisfying my desire to quibble over definitions, it seems prudent today to revisit this work and see how Hayek's distinctions stand. My hope is not to establish a perfect set of definitions but rather to point out interesting coincidences, contrasts, changes, and arguments. Perhaps we may shed a little light on matters which seem rarely considered without much bias and histrionics. Of course we will be general here because the definitions are general, the movements they describe having been diverse and having changed over time. Also I myself don't like to be pigeon-holed into broad categories and I'm sure you don't either. Nonetheless movements do have broad traits and similarities, so let us look at them and raise a few interesting questions. I've chosen to examine a few quotations from this insightful essay and discuss each in turn. It is that by its very nature it cannot offer an alternative to the direction in which we are moving. It may succeed by its resistance to current tendencies in slowing down undesirable developments, but, since it does not indicate another direction, it cannot prevent their continuance. This seems to me to be an excellent point slightly misstated (though Hayek goes on to make it later in one way or another.) It is certainly true that conservatism, qua disposition, has no finite ideology. Yet in practice it is not nothing. No one who identifies as conservative would say he he is not in favor of something, i.e., something has to be conserved. Such usually is either the status quo or something more distant in the past. It does then seem to offer a direction, just not a degree. The conservative disposition, then, has the potential for regression. For example, in attempting to conserve some idea one continually regresses backward in the hope of finding some pure form of the idea or some idealized implementation of it which one hopes to conserve. As progressivism has no delimiting factor to prevent its lurch forward, conservatism has none preventing its lurch backwards. Now reasoning backward and forward is good for discovering the ideological roots and logical ends of one's beliefs but it can carry one far afield and away from his own political tradition. Such brings us to the crux of Hayek's point above: once something exists at some point it can be called conservative. Thus today calling yourself a conservative says very little as you could essentially want to conserve anything and hence there is merit to complain about conservatives who are pro Social Security but against universal health care, who are in favor of this government institution but not that one. This is quite dangerous for any movement, since without a definite ideology it becomes, well, indefinite, and eventually infinite in scope. The conservative feels safe and content only if he is assured that some higher wisdom watches and supervises change, only if he knows that some authority is charged with keeping the change "orderly." This seems more true of a particular personality than any ideology. In fact it seems rather reasonable and may be phrased quite simply: "where is the good going to come from?" If you know what the good is why don't you try and bring it about? The difference again is temporal: the conservative wishes to conserve the good which already exists at the expense of attaining the good which does not, and the reverse for the progressive. The liberal position, however and as Hayek rightly says, is not the median between these positions. Existing institutions and future systems of organization are evaluated by how they advance or preserve something specific: liberty. This fear of trusting uncontrolled social forces is closely related to two other characteristics of conservatism: its fondness for authority and its lack of understanding of economic forces. Again these characteristics seem largely applicable to both the left and right. Since no one has made a case for mob rule, let us move the discussion to that of democracy. Now of democracy we may say there are two aspects, that of individual sovereignty and that of "rule by the people." The second characteristic is most often interpreted to mean, essentially, majoritarianism. Now the right seems fairly consistent in its anti-democratic, aristocratic, sometimes even monarchist sentiments. It favors bringing about the good through existing institutions. The left, however, often promotes democracy and populism. The will of the people, the current generation of people, is seen to take precedent over existing rules and legislation and thus the popularity of the notion of a "living constitution." In contrast the conservative sees abiding by inherited rules as necessary for the preservation of existing good. Interestingly, though, while the left (ostensibly) procures its will from the people, it manages oligarchy anyhow in the form of statism and bureaucracy. Again it is only the liberal who trusts that free men each managing their own interests can realize them. The similarities persist regarding lack of economic understanding. While we are not in a position here to categorize economic theories as leftist or rightist and then attempt to validate them, I would draw the one point that both are authoritarian. For example, both socialist models and rightist models like distributism require some body to decide how much of something you can own. In the last resort, the conservative position rests on the belief that in any society there are recognizably superior persons whose inherited standards and values and position ought to be protected and who should have a greater influence on public affairs than others. The liberal, of course, does not deny that there are some superior people - he is not an egalitarian - bet he denies that anyone has authority to decide who these superior people are. While the conservative inclines to defend a particular established hierarchy and wishes authority to protect the status of those whom he values, the liberal feels that no respect for established values can justify the resort to privilege or monopoly or any other coercive power of the state in order to shelter such people against the forces of economic change. Though he is fully aware of the important role that cultural and intellectual elites have played in the evolution of civilization, he also believes that these elites have to prove themselves by their capacity to maintain their position under the same rules that apply to all others. Hayek puts this particular point well although he does not here call the "proving of themselves" what it is: a marketplace. The broader question here is the same as above: how does the good come about in a society? The conservative or traditionalist view is that it comes from institutions designed to bring about the good. Yet there is no institution which functions well apart from the quality of those running it and just as a good institution can fall under the stewardship of lesser men so can a poor one succeed under great ones. What then, is the benefit of giving an institution a monopoly on particular cause? On this point too the conservative finds common ground with the socialist, this time in terms of his fear of what an unruly marketplace will produce. A marketplace will, of course, produce whatever people want (within physical possibility.) Some fear what "the many" will bring about and thus see a need to "guide" what is brought about. Connected with the conservative distrust of the new and the strange is its hostility to internationalism and its proneness to a strident nationalism. This point I am not particularly persuaded by. In America measures of both the left and the right, though small, are prone to both nationalism and its opposite, what British philosopher Roger Scruton has called oikophobia. In the 20th century nationalism was often coupled with both leftist and rightist regimes. Logically, though, it would seem that nationalism is conservative by nature since it seeks some connection to the past, presumably to a past perceived as laudable, but this is at least in part a coincidence. Such is because one need not love what one's country was to be nationalistic, but only what it is. Indeed revolutions often have a nationalist element. One could of course found a country ex nihilo and it be quite nationalistic. Yet the overwhelming tendency to draw connections to the past, even when tenuous or outright wrong, is quite revealing about human nature. Nearly everyone pays homage and lip service to America's Founding Fathers. There are very progressive people whose favorite president is Thomas Jefferson and very conservative people whose favorite president is Theodore Roosevelt. Many a man feels his ideas to be consistent with the founding principles of America in one form or another. . . .to the liberal neither moral nor religious ideals are proper objects of coercion, while both conservatives and socialists recognize no such limits. I sometimes feel that the most conspicuous attribute of liberalism that distinguishes it as much from conservatism as from socialism is the view that moral beliefs concerning matters of conduct which do not directly interfere with the protected sphere of other persons do not justify coercion. Thus for the liberal there is a bit of a problem, that even if you believe that something is good for all man's liberal nature prevents the use of force. At best you can attempt to persuade him to do the good. Liberalism implies that even if you believe something is morally wrong, the use of force is still worse barring certain grave instances. There is one respect, however, in which there is justification for saying that the liberal occupies a position midway between the socialist and the conservative: he is as far from the crude rationalism of the socialist, who wants to reconstruct all social institutions according to a pattern prescribed by his individual reason, as from the mysticism to which the conservative so frequently has to resort. What I have described as the liberal position shares with conservatism a distrust of reason to the extent that the liberal is very much aware that we do not know all the answers and that he is not sure that the answers he has are certainly the rights ones or even that we can find all the answers. He also does not disdain to seek assistance from whatever non-rational institutions or habits have proved their worth. The liberal differs from the conservative in his willingness to face this ignorance and to admit how little we know, without claiming the authority of supernatural forces of knowledge where his reason fails him. It has to be admitted that in some respects the liberal is fundamentally a skeptic . The Liberal bests both the progressive and the conservative because he has a finite idea he wishes to preserve and extend. He therefore does not see change as inherently good or bad, but as a potential for improvement. He doesn't see institutions as inherently corrupt or sustaining and he doesn't see methodology as inherently truth-finding simply because it is new or old. Hayek's lesson here, though, seems to be that progressivism and conservatism are dispositions more than ideologies. As ideologies they are diverse to the point of being infinite and thus indistinct. Still, though, he seems to find good in both, describing conservatism as "probably necessary" and praising progressivism for its optimism about the future. Regardless of labels a fairly common view of the problem goes something like this: there is good existing which ought to be conserved and bad existing which one would hope to root out, and good to be gained which we would hope to get, and potential bad we hope to avoid. Now how do we balance all of that to maximize the good? Thus in one respect an ideology is part definition of the good and part means of achieving it and in this respect conservatism/progressivism are only part of half of the equation. Directed by Ben Niles. 2007. While professional pianists may sit down at a modern concert grand piano and dominate the instrument, or get to know it, I think most of us approach the massive structure with some degree of reverence. The big shiny thing, usually the largest and often the only instrument at a concert, at least commands a lot of attention. It has quite the history too, from primitive designs in the middle ages, through the refinements of the Cristofori, the variations of the Viennese and English actions, and its ascendancy to dominance in the 19th century. Today it's hard to imagine a piano concert without a shiny grand, and arguably the biggest name in grand pianos is Steinway & Sons. 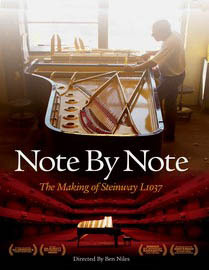 In part, then, this 80 minute documentary feels a tad like a commercial for Steinway. We don't get a look at other manufacturing techniques and no other brands are mentioned except to mention that Steinway is the only company which still does so much work by hand. Still, the tour of their facility in Queens, NYC makes quite an impression. What comes off most from this documentary is the tremendous degree of specialization needed to produce such a massive and intricate instrument. Indeed until recently pianos were likely the most complicated devices most people came into contact with and as such the tour of picking out the wood, the case's shaping, the painstaking fitting of the soundboard, the laying and stretching of the strings, the many phases of tuning (degrees of pre-tuning aka "chipping," rough-tuning, and fine-tuning) and the finishing is quite revealing. Still, though, considering the tremendous energy and variety of specialization needed to bring you a pencil, the process of bringing you a piano must be considerably more than depicted and I would have liked to see more of it. I'd have liked to see more about the shaping, weighting, and balancing of the keys, the construction of the hammer action, and the treatment of the wood. As wonderful as it is to see the shiny new Steinway arrive at a family's home and to see their son start to play for his parents and grandparents, I couldn't help feel we had skipped a beat somewhere. Nonetheless Steinway is rightly proud that so much of their process is done by hand, from shaving off infinitesimal layers of wood for a perfect fit to the subtlest adjustments of pitch. Parts of this process, some of the craftsman say, you really cannot explain. There is no precise measurement for how much to cut or stretch or shave. There is some, considerable perhaps, intuition involved. Those variables, the variable of the different experiences the many craftsman bring to how they work, and the variety of material makes each piano a little different. They all have their own personality. Some fight back a little and some are easy going. Some have a massive sound, others more subdued. More interesting indeed is this point, but still too belabored. It seems this aspect was mentioned by everyone in the film and by the time pianist Pierre-Laurent Aimard finds a suitable one in the great cellar of Steinway and Sons on 57th St. we've had the drift for a while. Pierre-Laurent Aimard made the best point about the instruments the Steinway method produces, which is that it would be a tremendous bore and a great loss if every piano were identical. The variety produces not only the opportunity to find an instrument especially well-suited to a particular piece, but to find one which brings something totally unexpected to a performance. Harry Connick Jr. commented on this apparent capriciousness inherent in musical and piano performance: unlike in other mediums, what you create at the piano disappears when you are done. Each performance is a new experience, with differences in both the performer and the instrument. Too, then, each performance contains the work of the many craftsmen who built that instrument, and they are rightfully proud of their work. They're quite a diverse lot, but they all looked middle-aged and older. I saw a couple of younger fellows here and there in the background, but I certainly hope there are more waiting in the wings, studying under the master craftsmen. Someone in the film mentioned how sad it would be if one day people wondered how Steinway made such instruments. Indeed, and let it not be necessary to have to rediscover it. Making this instruments is certainly demanding physically, but the concentration needed to maintain such attention to detail, and the persistent risk of ruining someone else's hard work (at great expense too), seems to me quite enough to keep you on your toes. More importantly, though, if so much is indeed intuitive in this process it is even more important that they pass on their knowledge to successors. Note by Note is an affectionate little documentary, and you come away with a great appreciation for the company which has remained in this business for over 150 years and succeeds by making a unique product, and the many craftsmen who put painstaking work (and their own personality) into each instrument. All of that work and variety in each instrument, from each performer, and each composer, added to the differences of each listener, make ever concert a unique experience. We ought never take one for granted. On teaching Aristotle's Nichomachean Ethics. I cannot figure why this sonata has not a greater notoriety. A contrapuntal masterpiece with a symphonic drive and with one of Mozart's best and most haunting slow movements, it ought to be performed more. Perhaps the notion of a work of this scale for keyboard four hands is not a common conception. Regardless of its fame it is a genuine advance in style. The interplay of the voices produces not a rollicking or mischievous banter but a tense dialogue. Abert has pointed out that the voices rise from the role of accompaniment to independence by contrapuntal (canonic or imitative) procedures. "In short, the usual concertante procedures and reciprocal accompaniment on the part of two players at the same instrument are replaced by a compact, genuine four-handed keyboard style." [Abert, 989] This sustained use for dramatic effect is also a new and distinct variation in Mozart's use of counterpoint. The whole movement rests uneasily on the opening adagio and even where the mood brightens there still vibrates an implacable nervousness. Abert identified the dreamlike, or rather nightmare-like, nature of this movement. We are drawn into it by the opening adagio and driven through it by the relentless drive of the imitative procedures. 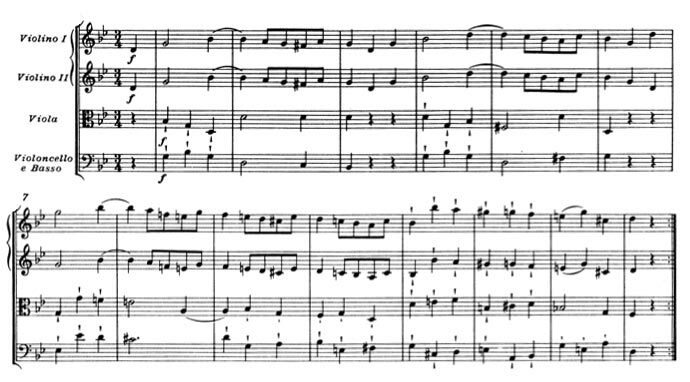 In the equally massive andante we again see large-scale canonical treatment of the themes and while the last movement recalls the ebullient rondos of the concertos its theme seems to hold a secret, one it never gives up even when we see the darker side of the seemingly innocent theme. Tovey ranked this theme with that of the phrase from the finale to the C minor concerto, about which Beethoven said, "Oh, my dear Ries, things like that will never occur to the likes of us." With its veiled energy this sonata presages the mood of Die Zauberflöte and with its polyphonic structure the G minor symphony. 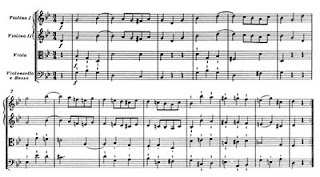 It was written in August 1786, the year in which Mozart wrote Figaro, the C minor and C major concertos (and also several small canons for three voices, KV.507, 508, and 508A), and the Symphony No. 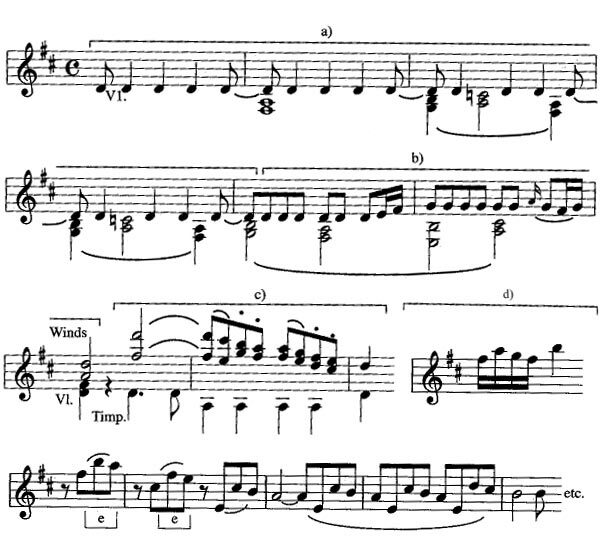 38 in D.
Like the preceding sonata this symphony begins with a slow introduction of about 35 bars. Similar also is the contrapuntal treatment, which is a vigorous contest among three of the movement's motives in double counterpoint. Theme C enters at m.143 in canon in the violins before it is joined by themes B and D. The contest between these themes is great but not terrible. It is energetic and full of bravura but does not rend at the heart. It is a vigorous, healthy contest. The transitional motive E leads us back to A for the recapitulation. We ought to take pause before discussing the "Great Three Symphonies." Perhaps the first thing we notice when looking into the history of these symphonies is the sheer volume of analysis they have invited in the last two hundred years, and in the last hundred from Abert, Dearling, Della Croce, Floros, Jones, Keefe, Mila, Robbins Landon, Sadie, Saint-Foix, Schenker, Sisman, Steptoe, Tovey, and Zaslaw. Like the Requiem the Symphony in C, KV.551 has a substantial literature of its own. Besides analysis there is much criticism of the symphonies and discussions of their nature. I think each symphony has been dubbed "Romantic" by someone at some point and the reasons for this moniker can be adduced with relative ease, though we ought not easily adopt it. Those who think of Mozart and think only of galanterie and "good taste," those who prefer Romantic effusiveness indeed ought to re-consider their view of the composer especially in light of his minor key works. Likewise he who considers Mozart to be "essentially Romantic" is off the mark too. Both conceptions lead one astray and they typify misunderstanding Mozart. Indeed in 19th century the two most popular Mozart concertos were the D minor and the last D major, the former seen as the pinnacle of his passion and the latter his taste. Instead we ought to strive for a more thorough and less taxonomic understanding, we ought to get to know the music and then later consider issues of style and genre. When we consider these symphonies, like the minor-key concertos we must wonder how surprising they must have been to their first audience. The following works are undoubtedly unprecedented particularly with regard to the bold harmonic modulation and the contrapuntal aspects of their construction. Yet alongside the passion there is restraint, just as in the C minor Concerto KV.491. In the case of the E-flat symphony there is even humor alongside the passion, as there was in the D minor Concerto KV.466. Yes, there are "typically Mozartian" features like scalar figures, a songfulness, and the frequent modulation. Yet the E-flat symphony is a surprising work from its implacable opening theme to its concluding forte chords which manage to intensify the sense of resignation with which the work concludes. There is lyricism, passion, modulation, and a measured restraint. More still we have both the intimate and the ethereal, the personal and cosmic. All of this, the passion and the play, the tunes and the arias, is Mozart. And more. One ought not to have a bag of adjectives at hand when listening, ready to pull out "Grecian" when we feel spaciousness or "Romantic" whenever we sense passion. Yet I cannot now suggest how one ought to approach these symphonies, other than to listen, and listen, and listen. . .
Lastly, given the specific nature of this series and the tremendous volume of work already done on these pieces we will not be treating them as fully as possible. I have attempted here and there to point readers in the direction of other scholarship. This main theme, which the strings introduce alone in A-flat but which modulates to the relative F minor in its recapitulation, will inform the whole of the movement. It too is a perplexing little theme containing apparent opposite features, Abert calling attention to the songfulness of its cantilena and Saint-Foix its "faintly martial character," but this contrast will not seem inappropriate when we see where this little theme will take us. With the plagal harmonies and discrete scoring for the cello the opening unfolds with a delicate loftiness. Yet after the theme's recapitulation the winds enter (m.28) in F minor with an arresting figure, piano, of staccato quavers and descending semiquavers into a menacing tutti forte, where another theme ratchets up the tension against staccato figures until we trot to a halt piano with semiquavers on B in B-flat. Now the clarinets and bassoons trade the second part of our opening theme back and forth with the bass strings. At last the strenuous theme in the winds which introduced the second subject enters, now tamed, in imitation in the winds rising from the bassoons through the flutes against the pedal point in the strings. 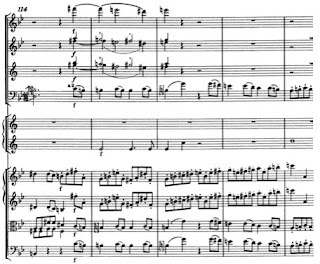 This counterpoint in the woodwinds over the sustained strings is a wondrous and serene gift of a moment, one which paves the way for the return of our gentle opening theme. This theme begins as before in the strings but rises to the woodwinds after which the strings add a counter-melody. The dialogue with the winds continues but now the winds offer a playful descending scale staccato as the first violins and bass strings take the main theme. Now the A-flat minor version of the theme we heard early on leads to B major and the recapitulation. Another dialogue between winds and strings initiates the coda and a chromatic descent leads to the close, tutti forte. Hearkening back to our discussion of creative power we might look at the opening of this symphony and ask from whence its creative power comes? Tovey pointed out that it is, at least on paper, not so dissimilar from the overture to Il barbiere di Siviglia. Yes, and as Tovey says, what a world apart they are! The difference, slight in practice but vast in conception, is that between intelligence, competence, cleverness, even inventiveness, and the "highest poetic power." What energy there is bound up not just in the opening theme but in the opening bar. Why is this so full of portent? We begin with only the strings, piano, with the violas divisi, i.e. that they should be in two groups to play full chords, double in thirds, et cetera. Likewise on first beat the basses pluck off the tonic. Yet the violins do not enter until the next beat with the main theme, whose anapestic weighting (i.e. short-short-long) will induce the rhythmic drive of the piece.Yet the third of those anapestic groupings ends with rising crotchets from V-III. Also the second half of this main theme ends with two crotchets both on IV falling from V. Thus this main theme itself is a sort of tense and unstable unit melodically, rhythmically, and harmonically. The consequent of the main theme is cut off by the introduction of the woodwinds who with their rise and fall six semitones from and to D#, piano, and the lack of oboes makes an eerie entrance which heightens the tension. The winds then add some punctuating chords as the strings hammer the anapestic figure on D. After a restatement of the main theme heightened by pedal points in the winds a new theme enters at m. 26. Now in the relative B-flat major this new figure rises in staccato quavers against the basses flickering with quavers in thirds, until launching into a rising scalar passage in the violins and amplified by sforzato half-notes in the basses. Now the second subject enters, first in the strings and then the winds before "sinking dreamily" (in Abert's words) into A-flat major. Now all of a sudden we enter a whirlwind crescendo which sweeps us back into the main theme and with a descending scalar figure a quiet moment forms in which the woodwinds treat the little anapestic figure imitatively. Then another forte outburst, and the violins follow suit. Concluding in B-flat the section ends. This contrapuntal explosion "rages in double counterpoint over the regular harmonic sequence in E minor, A minor, D minor, G minor, C major, F major and B flat major, not stopping until it reaches the dominant of D minor, while the first element of the theme, which has been hurled through every tonality but which is now compressed into the semitone step of its sigh motif, brings the whole section to an end like a shrill outburst." [Abert, 1125] Now the strings and winds trade the first figure of the main theme back and forth until it is replaced in the winds by a ghastly figure which slices in sforzato. The flutes and oboes now trade the figure, which now holds all the weight and tension of the piece, as it descends in a chromatic passage and the tension unwinds before the main theme returns piano. The recapitulation is rife with innovation even though we don't reach the heights of tension we did in the development. 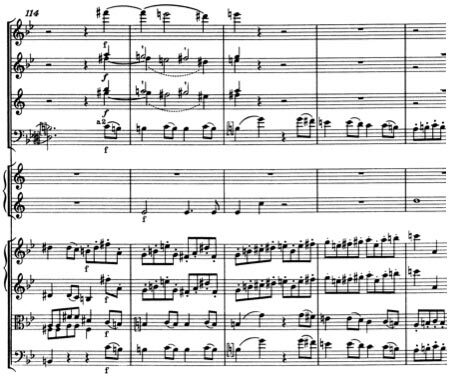 After a restatement of the main theme our figure from m. 26 (which Abert dubbed the counter-subject and Foix the sequel to the first subject) enters is itself plunged into vigorous counterpoint between the 1st violins and basses, from which it emerges in G minor. Saint Foix was certainly right to call this essentially another development section. Now the two main forces of the work, the tense main theme and the resigned second subject, are finally directly juxtaposed. (Like in the overture to Don Giovanni, we have antithetical ideas in sharp contrast, albeit differently developed.) For even more tension the stabbing sforzato figure and the sighing anapest figure return, again all brought now into the most direct comparison. All of the force of the movement is concentrated one last time before plunging into the final run and the final three chords, based on the very first figure. Why is it that people seem to be more transported by the preceding, aggressive movement than this more tender but equally expressive movement, at least if popularity is any indication? Let us hope we are wrong in our inference. 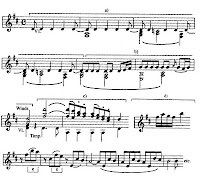 This sonata-form movement with a double exposition shares with the preceding movement of course a certain gravity, an opening in the strings only, intensification via imitation, and many and bold modulations. Yet here the mood shifts not between rage and resignation but. . . one can only crudely and glibly describe this movement. What expression Mozart has made with this lyrical figure, and again with another incredibly simply figure, this of but two thirty-second notes. Who would expect the vicious struggle of the Allegro to return here? Yet here too we find genius in the effects of these rhythms which are treated in counterpoint in which they interrupt each other, producing a tremendous agitation. The Trio in contrast picks up the resigned motif from the allegro, trading its theme between the strings and winds. The opening measures establish one group in the strings moving from the tonic triad and the second group in the winds modulates to the fifth in D major. In D now we cannot conclude and too a little coda interrupts the phrase and more still D is extended after the repeat, delaying the return to the tonic. This dialogue between strings and winds and its graceful little phrase brings us the idyllic peace we long for after the trio which brought back and amplified the struggle of the allegro. The winds have the last word with the theme. Though this trio does not figure substantially in our look at this symphony, the reader is encouraged to seek out Leonard B. Meyer's Grammatical Simplicity and Relational Richness: The Trio of Mozart's G Minor Symphony. It is excellent and contains a wealth of information both directly pertinent to the study and of the incidental type one might never seek out or find by itself. Meyer reveals a wealth of craftsmanship in this tiniest of pieces. We find here another deceptively regular theme, in two equal parts, the first piano in the strings and the second a forte response from the tutti. The ascending figure from V to I followed by the triad marked staccato launches us forward into the frustrated desperation that lies in that jump of the third up to B and the following suspension. This movement amplifies the energy from the opening one last time, to the point of "demonism" to both Saint-Foix and Abert. Here is the so called "daemonic" Mozart, a phrase itself a bit hackneyed after the many attempts to combat the view of Mozart as the composer of prettiness and taste. In the consequent phrase with the repetitions and the tutti's interrupting forte chords, the tension is amplified as we wait for the energy of those first bars to erupt, which it does in a fury of 1) rushing descending scales in the lower strings and a wickedly aggressive four crotchet figure in the other voices. The violins and the lower strings then trade the scalar figure back and forth in a whirlwind until we come, disoriented, to a halt at VII-V at m. 70. It is then intensified in the winds and with a chromatic motion until the return of the first theme which brings back its aggression. The main theme returns in the development and after a highly disorienting chromatic passage (of simple crotchets and rests) the winds starting with the flutes begin to imitate the theme in the strings. One cannot overstate how remarkable the following fugato passage remains. It brings the tension of the whole movement and the whole symphony to a fevered pitch from which it will not relax. With continuous and restless modulations and the relentless stretta entries of the theme, all maintained forte this finale is a positively exhausting climax. Finally in the recapitulation the second subject, long silent, returns and is heightened by being in the tonic G minor and taken up and extended in the strings before the aggressive second half of our main theme drives us to the end. We come to it at last, the Great C major Symphony. There comes a point in the life of great works of art at which their own fame and history have created such a world around them that they are in danger of becoming obscured. KV.551 has generated such a world of both sentiment and scholarship around it. Eventually all of that sentiment and scholarship starts to ossify into an impenetrable mass and one has trouble experiencing the work. The sentiments have turned into epithets and the scholarship has murdered to dissect. Thus you have the "Olympian symphony with a fugal finale." I will, then, attempt to be brief and elucidating at the expense of being thorough. It is treated, as Rosen says, [The Classical Style, 82-83] twenty measures later with a counterpoint. Thus the two contrasting elements of this musical phrase are reconciled. The first half of this theme is akin to a martial fanfare and recalls the Viennese tradition of grand trumpet and timpani celebratory pieces. (see Brown's essay in "Other Reading" below.) In contrast to this exuberant and earthly theme is the lofty and ethereal one which follows. This contrast and subsequent reconciliation form the heart of the exposition as the great celebratory dancing (in ingenious and varied imitation) does in the development. Like in the G minor symphony this movement resumes the theme of the first. Its theme also has something both earthy and lofty about it and it too receives contrapuntal treatment. What is perhaps most ingenious about this movement is perhaps also obvious: the manner in which all of the themes so satisfyingly combine in the contrapuntal synthesis in the coda. The conclusion, though, is not contrapuntal but as Rosen says, "pure concerto style" [Sonata Forms, 324] in its reprise of bars 13-35. Contrapuntal procedures in this movement are employed, then, for both development and synthesis. We also see here so many of Mozart's practices: contrast of homophonic and contrapuntal textures, many modulations and modulations through the circle of fifths, a cantabile line, dialogue between the winds and the strings, rushing scales and sliding figures, contrasting themes, chromatically descending lines, and fugato development. Here these practices are explored and synthesized on a grand scale, with a release of energy paralleling the sinfonia to Figaro, drive paralleling the preceding G minor symphony, and an enervating, exalting effect unparalleled. Sisman, Elaine R. Mozart: The Jupiter Symphony. (Cambridge Music Handbooks) Cambridge University Press. 1993. Sisman, Elaine R. Learned Style and the Rhetoric of the Sublime in the 'Jupiter' Symphony in Wolfgang Amadè Mozart: Essays on His Life and Music. ed. Stanley Sadie. Clarendon Press. Oxford. 1996. Rosen, Charles. Sonata Forms. W. W. Norton and Company. New York. 1980. Zaslaw, Neal. Mozart's Symphonies: Context, Performance Practice, Reception. Oxford University Press. New York. 1989. Not to be confused with the sonata fragment KV.497a. Tovey, Donald Francis. Essays in Musical Analysis. (Six Volumes.) Volume I: Symphonies I: Sonata in F Major for Pianoforte for four hands, KV.497. 1935. The Norton Critical Score (W. W. Norton and Company, NY. 1967 ed. Nathan Broder) is a handy volume, containing 1) the score edited by H.C. Robbins Landon, 2) Abert's analysis, 3) Alfred Heuss' hermeneutical analysis, and short reflections from ten other critics from Hanslick to Tovey to Einstein.